Just hours before the Sooners’ NCAA Second Round contest, OU senior guard Buddy Hield was named one of four finalists for the James A. Naismith Trophy, recognizing the most outstanding men’s college basketball player. Joining Hield as finalists are: Malcolm Brogdon (University of Virginia), Tyler Ulis (University of Kentucky) and Denzel Valentine (Michigan State University). Hield, who currently leads all Power 5 players in scoring by averaging 25.0 points per game, was recently named Big 12 Player of the Year for the second consecutive season. He is currently the only player in America averaging at least 25.0 points and 5.0 rebounds per contest. Hield has 10 games of at least 30 points this season, which is the same total as the rest of the Big 12 combined. Through 33 contests this season, he has 17 games of at least 25 points (most in the nation) and 24 outings of at least 20. 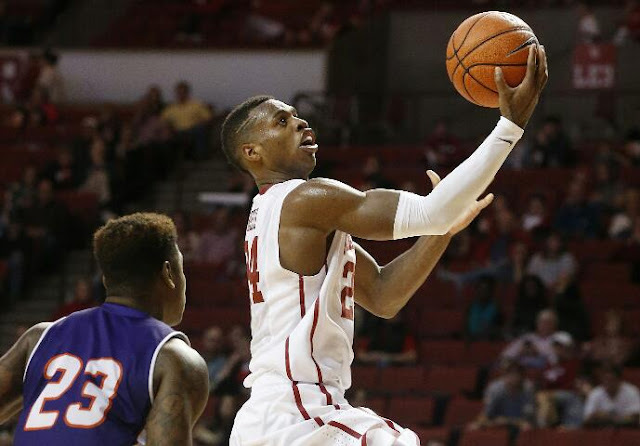 Hield’s 79 3-pointers in conference play this season marked the most ever in Big 12 history. His 130 season treys (and counting) are also a Big 12 record (and are the most in college basketball). His 448 combined points in conference play were the third-most in Big 12 history, behind only Kevin Durant of Texas (462, 2006-07) and Michael Beasley of Kansas State (455, 2007-08). Hield’s 24.9 points per game in conference games marked the third-highest average ever in a Big 12 campaign (Durant-28.9 and Beasley-28.4). The Bahamas native currently ranks fourth all-time in both OU and Big 12 history in career scoring with 2,192 points. Hield finished with 1,202 points in conference play over the past four seasons, the most by any player in Big 12 history. The four finalists were chosen by the Atlanta Tipoff Club’s national voting academy, comprised of leading journalists from around the country, current and former head coaches, former award winners and conference commissioners, which based their selections on outstanding on-court performances during the 2015-16 college basketball season. The vote was tabulated and certified by the accounting firm of Habif, Arogeti & Wynne, LLP. HA&W is the largest independent accounting firm in Georgia and one of the top 50 firms in the United States. The winner will be announced on Sunday, April 3 at the Naismith Awards Brunch delivered by UPS in Houston.